The two-year £1.6m project, funded by the Polonsky Foundation, will digitise more than 800 medieval manuscripts. This includes every medieval Greek manuscript in Cambridge and all those belonging to the Bibliotheca Palatina collection, split between Heidelberg and the Vatican. It will provide a unique insight into the chronological range of Greek manuscript culture, from the early Christian period to the early modern. Dr Suzanne Paul, Keeper of Rare Books and Early Manuscripts at Cambridge University Library, said: “The Cambridge and Heidelberg collections bear witness to the enduring legacy of Greek culture – classical and Byzantine – and the lasting importance of Greek scholarship. Full page image of Saint Mark from a Greek New Testament manuscript at Cambridge University Library (CUL MS DD.9.69) . “The works of Homer and Plato were copied and recopied throughout the medieval period and the early biblical and liturgical manuscripts are profoundly important for our understanding of a Christian culture based on the written word. Once digitized, the Cambridge manuscripts will join the works of Charles Darwin, Isaac Newton, Stephen Hawking and Alfred Lord Tennyson on the Cambridge Digital Library. Since its launch in 2010 – with the digitisation of Newton’s Principia Mathematica making headlines around the world – the treasures of Cambridge’s Digital Library have been accessed more than 13.5 million times. 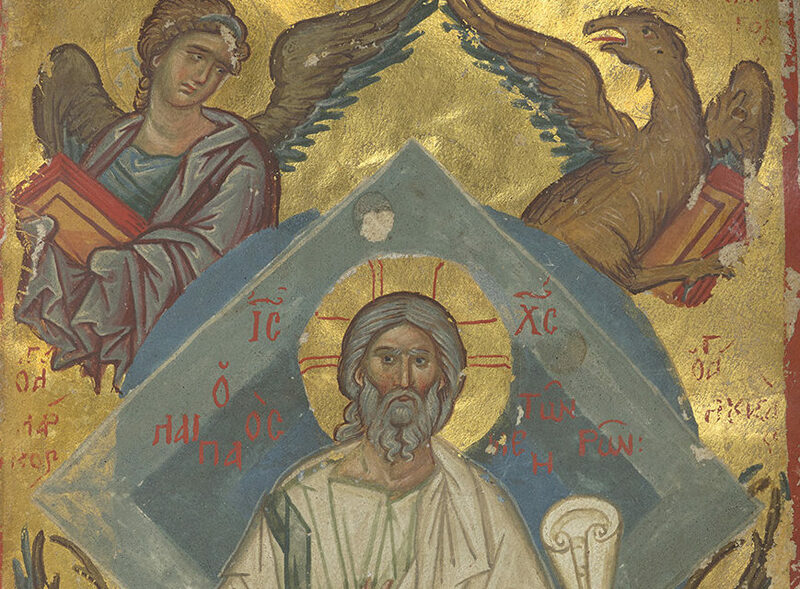 A Greek New Testament manuscript showing Christ surrounded by the symbols of the four evangelists from the collection of Cambridge University Library (CUL MS DD.9.69). With more than 38,000 volumes digitized to date, Heidelberg’s Digital Library has been visited by scholars and members of the public in 169 countries, outlining the global appetite for digital access to collections which would be impossible for most to access directly. The current status of these collections presents significant challenges to scholars both in terms of cataloguing and conservation, with the medieval bindings of many manuscripts in a fragile state. The current catalogues for them date from the nineteenth century; many of those for the Cambridge manuscripts were written by the scholar M.R. James, Provost of King’s College, Cambridge, but best known for his ghost stories which remain popular to this day. Of the Cambridge Greek manuscripts, around 210 are held at the University Library, 140 at Trinity College, and a further 60 spread across 11 other colleges and the Fitzwilliam Museum. Of the Bibliotheca Palatina Greek manuscripts, 29 are in Heidelberg and 403 are in the Vatican Library, having been transferred there from Germany as a spoil of war in 1623. “Opening up some of the most important Greek medieval manuscripts to not just scholars, but the widest possible audience, is another key milestone towards our goal of sharing Cambridge’s treasured collections with the world,” said Dr Jessica Gardner, Cambridge University Librarian. Dr Leonard S. Polonsky CBE, Founding Chairman, The Polonsky Foundation, added “Our Foundation is proud to support this important collaboration between the ancient universities of Cambridge and Heidelberg, which represents a significant development for both institutions. For Heidelberg the project will complete the virtual reconstruction of the Palatine Library that is being carried out with the Vatican Library.